This beautiful, handpainted yellow embossed Carlton Ware design was introduced in the late 1940s and continued into the early 1950s. It was made in three colourways - pink, green and this one on offer, yellow. The 'Poppy' pattern is very different from the 'Poppy & Daisy' design. This is because this Poppy design is formed into the shape and the finish of each piece, thus creating the detail of many flowerheads which overlap each other causing the impression of many folds and details on the petals. The brightly handpainted poppy head has black and pink stamens that surround the heavily embossed green centre. 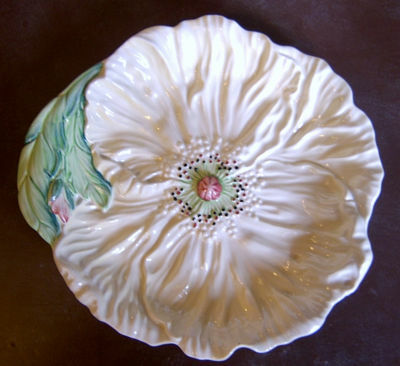 There is a fern-like leaf similar to that of an oriental poppy which curves around the edge of the plate. This plate is shape number 2257/3 and comes in three sizes in the series. It measures approx 8.75 inches (21.5 cms) in length with a maximum width of slightly less than the length. The base is backstamped appropriately. There is no crazing nor chips/nibbles.